The new Great Shepherd: Why are evangelicals flocking to Trump? 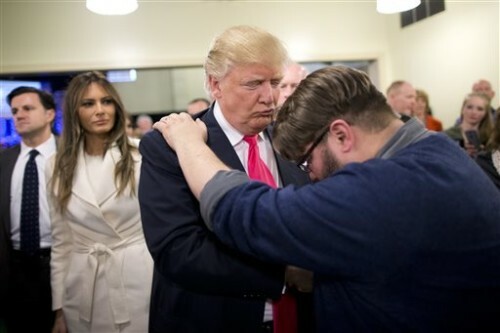 NEW YORK (AP) — The list of prominent evangelicals denouncing Donald Trump is growing, but is anyone in the flock listening? The bloc of voters powering the real estate mogul through the Republican primaries is significantly weighted with white born-again Christians. As Trump’s ascendancy forces the GOP establishment to confront how it lost touch with so many conservative voters, top evangelicals are facing their own dark night, wondering what has drawn so many Christians to a twice-divorced, profane casino magnate with a muddled record on abortion and gay marriage. John Stemberger, a Trump critic and head of the Florida Family Policy Council, an affiliate of Focus on the Family, said many evangelicals have changed. Litmus tests that for so long defined the boundaries for morally acceptable candidates seem to have been abandoned by many Christians this year, he said, no matter how much evangelical leaders try to uphold those standards. “Evangelicals are looking at those issues less and less. They’ve just become too worldly, letting anger and frustration control them, as opposed to trusting in God,” Stemberger said. Trump has won the support of one-third of self-identified born-again Christians across the dozen or so states that have held GOP contests and where exit polls were conducted. In eight of the presidential primaries, he won more evangelicals than Ted Cruz, a Southern Baptist who has made appeals to conservative Christians the core of his campaign, according to polling. Trump is a Presbyterian who has said he has never sought God’s forgiveness for his sins, botches Bible references and, on a recent campaign visit to church, mistook a communion plate for a donation plate. Critics insist exit polls have overstated Trump’s share of evangelical support, arguing many voters identifying themselves as “born again” in primaries are only nominally Christian.